We are pleased to announce the launch of Power Manager and Power Manager Pro 4.5. This significant update introduces new triggers, Schedule Assistant tasks, and numerous improvements. We have also continued to work on the internal scheduling engine to ensure it remains modern and efficient. New: Added action await sleep. New: Added Schedule Assistant for launching an application on log in. New: Added Schedule Assistant for running a script on log in. New: Added Schedule Assistant for running a script before sleep. New: Added Schedule Assistant for running an Automator workflow on log in. New: Added Schedule Assistant for mirroring files on log in. New: Added Schedule Assistant for running a script on log out. New: Added Schedule Assistant for mirroring files on log out. New: Added offset to sun trigger to allow times relative to astronomical events. New: Added host wide preference notifier.login.position-vertical to adjust Login Window notification. Change: Core install better stops and restarts existing launchd jobs during update. Change: Renamed pmnotify.app to Power Manager Notifications.app for clarity of purpose. Change: Updated appearance of the Login Window notification. Change: Modernised and started refactoring Power Manager Notifications.app. 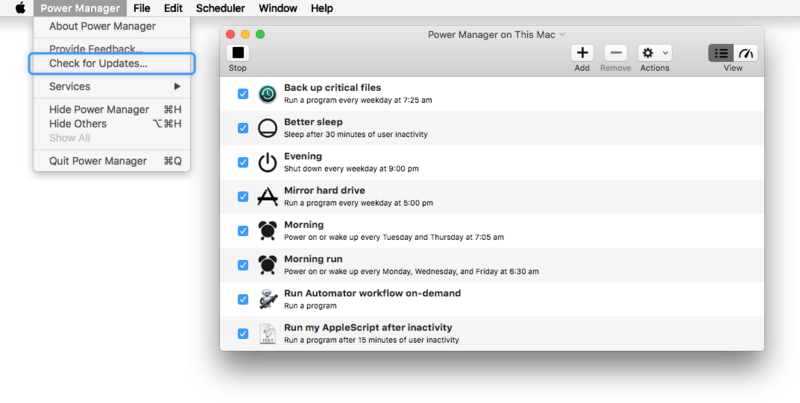 Change: Quietened Power Manager Notifications.app log messages. Change: Updated power assertions used by other processes not to idle dim or sleep. Change: Refactored code previously required for pre-OS X 10.7. Change: Removed legacy code previously required for pre-OS X 10.5. Change: Updated external links in software and documentation to https://. Change: Fixed warning in PAM authentication. Change: Updated application scripting definition to dynamically include CocoaStandard. Bug: Fixed warnings by modernising code for OS X 10.11. Bug: Fixed buy now button on licence sheet. Bug: Fixed event editor group styling.